On January 23rd, 2015 I became a mom for the very first time. It was one of the most beautiful and terrifying experiences of my life so far. My son was born with a severe heart defect and has since had two open heart surgeries. My son’s name is Xander and I wouldn’t be where I am today without him. He was, and will always be my greatest motivation. Let me fast forward a little further. I think to give a clear picture of my health and fitness today, I must go back and explain my health and fitness background. Growing up, I was always athletic. I played basketball, ran track and all ways remember being outside and playing with the boys. Once college came around, I no longer had a sport to keep me in shape, so naturally, with no nutritional background and no coach keeping my a** in check, I not only gained the freshman 15 but probably an extra 10 on top of that. That was my first run in with true weight issues. My sophomore year I realized that it was my choice if I wanted to stay that way or not. I decided to start going to the gym and it was there that I found Zumba. I became a Zumba instructor and was instructing 5-8 hrs a week. I burned about 1,000 calories a class and was in the best shape of my life… or so I thought. You see, I still had NO nutritional understanding. At that time I was eating 1,500 calories a day and had absolutely no clue about macros or how they worked. I thought those 100 calorie snacks were a healthy option and I would never eat after a workout because I would gain back all those calories of course (sarcastic, obviously). To sum it up, I was young and dumb and so focused on being SKINNY. Some girls are naturally skinny and that is okay, I am not that girl. 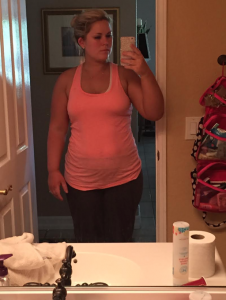 I was so focused on the number on the scale. You see this picture below. This is the “skinniest” I have ever been. It was my honeymoon and I weighed 165, yes ONE HUNDRED AND SIXTY-FIVE POUNDS. Guess what, I thought I was fat (GASP!) simply because of that stupid number. Today I sit at a happy and healthy 185 and couldn’t care about that number at all because of how I feel. I worry more about my fat percentages now and my performance. But I’ll talk more about that in a second. Okay, fast forward a little further now. Matt (my husband) and I were married about 6 months when we decided to start having kids. Excited and nervous, we were ready for the next chapter. Long story short, we miscarried three times in the course of a year. 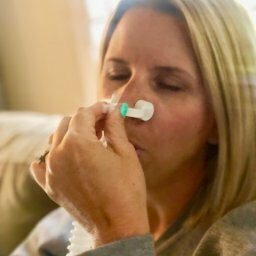 If you don’t know much about miscarriage (I had no clue before my first) it’s not only an emotional roller coaster and devastating, but your body takes a huge hit. I stopped working out altogether after my second miscarriage because one doctor told me that exercise could be the cause (some doctors, I swear). Thankfully I found out what was wrong and did a few different things and became pregnant with Xander shortly after my third miscarriage. Remember how I said I was 165 on my honeymoon. Well, by the time I became pregnant with Xander I was 215. Yes, 50 pounds gained in a year and a half. This is what miscarriages, lack of exercise and a not so great diet did to my body. By the time I gave birth to Xander I was over 250 pounds. I was depressed, my anxiety was through the roof and I felt so embarrassed of myself every time I looked in the mirror. You see, I am not saying that baby weight is bad or ugly, it’s absolutely natural and beautiful. It was all the emotions that came with it, it was much more than baby weight. I would look at myself and be reminded of all the pain, it was almost like I was carrying loss on my body and I saw the sadness every time I looked at myself. After I delivered my son, I realized what a miracle life and health truly are. Having a child is a life changing experience, but I was told that my son might not make it and if he did, he would need an emergency surgery soon after birth. Praying for the best but partly preparing for the worst, my son was born and was sent home with us within just four days of being monitored in the NICU. His heart was broken, but he did not need open heart surgery until he was eight months old. I realized then just how blessed I was to have every ounce of health for not only my son but for myself. It made me realize just what I had been taking for granted all of my life. I was born without defect and without illness and had been treating my body so poorly. After I had my son, I realized that I could not expect him to take care of his body if I wasn’t leading by example. I also realized that I could not emotionally give my heart to my husband if I had the weight literally suppressing every ounce of joy in my life. I realized that I was not able to give Xander the love and care he deserved if I wasn’t taking care of myself as well. It’s like having my son changed my perspective and I knew I needed to change, I just had no idea where to start. Three weeks after having Xander I was ready for a change, and not even cleared by the doctors yet, lol. I decided I would do something. I started eating paleo and tracking my calories again. I started running (more like walking fast) every day. I started with hardly a half mile and progressed over the next couple of weeks. Once I got sick of that, I started doing my old Zumba routines in my room while Xander napped every day. I would have my latin music on low and dance for an hour by myself. Looking back now it’s hilarious, but hey, it did the trick. I started to see my weight slowly drop off and I was starting to feel so much better emotionally, spiritually and even relationally. Four months after having Xander, still about 220 pounds, still insecure I knew I wasn’t finished yet. I made a decision that would change the course of my life. One of the best decisions in my health this far, I purchased a Groupon (no the Groupon itself wasn’t life changing lol). That Groupon was to Crossfit Power Lab in Yucaipa, Ca. 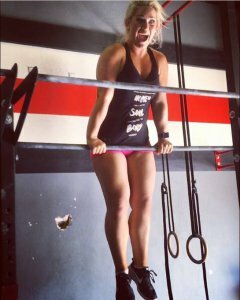 I had tried about a month of Crossfit in the past but never stuck with it. I knew I needed something more than Zumba in my room. I thought, at least I can do two weeks of this, its only 10 dollars. I bought one for me and my husband and he was so excited that I actually wanted to work out with him. I have to say, I was absolutely terrified to workout with him. I was 220 pounds at 5′ 7 and my husband was also 220 pounds at 6′ 2. He is a hot firefighter and I was a sad, new mom with baggage. I was so nervous to go to Crossfit because I figured there were going to be ripped, in shape girls in sports bras lifting heavy weights… and then there would be me bahaha. But, I put my insecurities to the side and left my comfort zone because I knew that’s a BIG key to change, doing things that aren’t comfortable. I assumed that we would do the two weeks and go on to the next thing because there was NO WAY we could afford Crossfit for the both of us. Well, two weeks later we were hooked. I was so excited to go each day and my husband knew it. 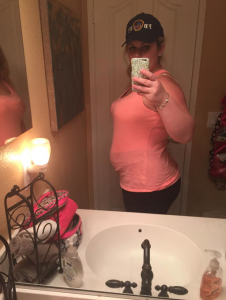 Our two weeks were just about up and on the way home one night my husband looked at me and said, “I am so proud of how far you have come, I know you feel better and that means more to me than anything, I want us to sign up and do this because I know our health is more important than other things we are spending money on. I want to do this and I want this to be something we do together”. We signed up that next day. There are only a few decisions in life that change everything and this was one of them. My husband has been the greatest supporter and my number 1 fan. I love him dearly and know that his support has been vital in my journey. It was at Powerlab that I reached all of my fitness goals. One of my first classes, I was so embarrassed because of Josh, the owner, had us do an ab mat sit up. If you don’t know what an ab mat sit up is, its a normal sit up… but WAY HARDER! It’s slightly awkward as you lay on the floor with a raised mat fitting in the arch of your lower back. You put the bottoms of your feet together as your knees both lay to the ground. Your legs are open and this position is supposed to take your legs out of the sit up so that you use primarily your core and hip flexors to finish the movement. Well, this new momma had no core and had no idea what a hip flexor was, so obviously could perform the “simple” sit up. Yes, when I started Crossfit, I could not do ONE sit up. But, as embarrassing as that was, I knew it wasn’t forever… there would be a day where I could do a sit up. Little did I know that I was not only going to be able to perform a proper ab mat sit up, but I wouldn’t have been able to fathom what I was capable of. It took consistency, drive, and determination on my part but it also takes a family, a group of people that work together to motivate and support one another. There are so many people I have met from Crossfit that have encouraged, inspired and cared for me and my family. 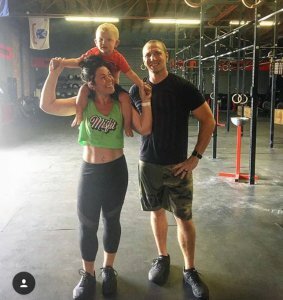 One of those being the owner of Crossfit Powerlab, Josh Gilliam, and his amazing family. 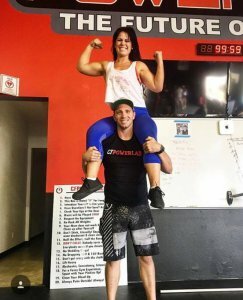 Josh taught me so much of what I know about nutrition and Crossfit and gave me a chance to start coaching just 9 months after starting Crossfit. He took a risk and I am grateful for that. Coaching has been such an incredible addition to not only my own self-health; but I have been given an opportunity to love, encourage and hopefully inspire others to do the same in the process. Another person that has been with me from the very beginning is Marly Paulus at BodymetRx. As soon as I signed up at Powerlab I started a nutrition challenge, which I won 6 weeks later. 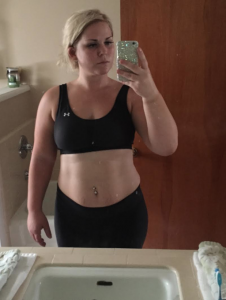 I scanned for the first time withBodymetRx a month after starting Crossfit and have been scanning with her every few months since then. It’s so incredible to see progress tracked in real measurements and numbers. It has been such a great motivator and I am so grateful to have pictures of my progress over the past two years. It’sBodymetRx that helped me see my body for what it really was. It was BodymetRx that helped to change my mindset from focusing on the scale to focusing on the real results. Actually, one of her first recommendations was to throw away my scale… I thought she was crazy but of course, I never used it again. I started with the BodymetRx 3D body scan which shows inches (+/-) as well as the body fat scan which shows a bunch of different things from body fat percentages to lean mass. I started at 38% body fat and over two years lost over 15% body fat. All of my life I had been told I was “big boned”. I used to think that was an insult, or a nice way of saying A BIG GIRL, lol. I realize now that I wasn’t actually big boned but naturally have a very high lean mass. According to the BMI, at 5′ 7 I should weight under 130 pounds to be considered “healthy”. Well, thanks toBodymetRx I now say, “SCREW YOU BMI”. My lean mass is 135 pounds. Lean mass is what you would weight if you did not have an ounce of fat on you. So, I could not be 130 pounds on the scale if I tried. This is when my mind set about weight started to change. 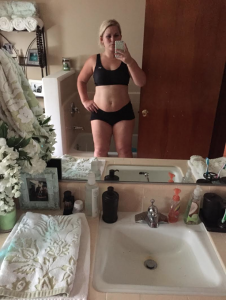 I started to focus less on the number on the scale but more on the results from my scans with Marly. I focused on body fat and how I was performing as an athlete. 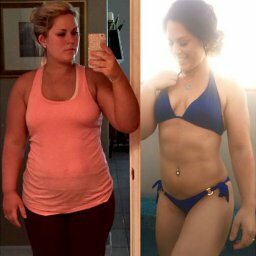 Not only did BodymetRx help with my ideas about weight and my weight loss journey, but it also helped me learn more about nutrition and what my body needed to lose FAT and perform well at the same time. I learned through an RMR (resting metabolic rate) test at BodymetRx what my body burned when it was at rest. Remember that 1,500 calories a day that I was eating in college? Yeah, how about adding 1,000 calories to that. Never would I have believed her without the results from the RMR. It wasn’t till I started eating enough, of the right stuff, did my body start to respond. That’s when I started dropping more fat and gaining muscle. I couldn’t be any more grateful for BodymetRx and Powerlab as they have been two key components in reaching my weight loss and fitness goals. I fell in love with Crossfit at Crossfit Powerlab because it really isn’t all about how you look in the mirror. That’s where I think other gyms miss the mark. Crossfit is about being the best YOU can be and doing the best YOU can do each and every day. It’s about being consistent and working past comfort, it’s about being mentally tough and learning self-control. It all works together in unison. You eat healthy because, for some, you don’t want to puke in class the next day. But for most, you eat healthy to get stronger, be better, be faster. Guess what, if you eat better to perform better, I guarantee you will like the way you look… it’s that simple. If there is one thing I have learned and can leave you with is that YOU have the power to change your future. YOU are never to far gone. Your health is a precious gift and you shouldn’t take it for granted. Now, does that mean you have to do Crossfit, or do exactly what I did to be healthy? Absolutely not! There are so many fitness crazes out there, and so many ways to eat healthily, you are bound to find something that inspires you. But please, I beg you, DO NOT do it for the sole reason of losing weight or fitting that bikini next summer. This motivation does not last and will fail you. Find something, someone, that motivates you, inspires you to regain control over your life. Just imagine all you can do, all you can be by making one small decision each and every day towards a better and healthier you. You know I have to say, if you are going to focus your time and energy on something, you need to make it positive. Having a baby with a severe cardiac defect could have potentially stolen my joy and caused me severe anxiety.I could have spiraled even further down the road I was on but deciding to pour my energy and thoughts into changing my health was one of the best decisions of my life. It changed the way I saw my self, my situation, and my relationships. I wish I could go back and thank my past self for having the courage to start this journey.